The idea behind this type of report is that busy executives don’t have to remember to log in to a BI solution to actively monitor their most important metrics. Instead, they use the Business Intelligence (BI) solution to set up and monitor Key Performance Indicator (KPI) thresholds as well as automatically email daily exception report. If a different manager owns KPIs, he or she may already have entered an explanation for the variance, presumably visible via comments. A KPI Report that enables users to write comments can further filter the report’s most critical information for other users. For example, comments can quickly explain an anomaly, saving users’ time from having to investigate themselves. This is a rare but highly valuable report. With this report, a user can “scoop” up comments across all departments, as these likely represents important issues. After some time, the user can analyze if any issues are recurring. This report provides all pertinent information for a certain type of manager (executive, sales, services, etc.) on a single page, in an easily readable format. This report contains a summary of key financial information related to revenues, liquidity, payables and receivables. The most powerful dashboards have a specific focus that either support the responsibilities of a person or provide an in-depth focus on a specific business area such as products, customers, projects, etc. This dashboard focuses on the performance of your own organization.. For example, a benchmark dashboard monitors your business performance compared to competitors or industry averages, when available. This report is a way for executives to find important issues across the entire organization at a glance. It produces all variances above a certain threshold, across all departments and subsidiaries in a single report. Oftentimes, managers are busy or do not have the means or skills to quickly analyze important areas for their business unit. A “DecisionPack” presents all significant reports and graphics within a single workbook or presentation. Some Corporate Performance Management (CPM) solutions can produce these automatically as workbooks in Excel or as storyboards/playlists within web portals. A modern BI solution should provide each with a tailored set of reports, dashboards and planning templates for each department. When organized in the same BI portal as the corporate-level content, these departmental-level templates allow managers to “drill down” into detailed information, improving the communication and understanding of individual operational areas. This dashboard targets a single area like sales and within it, provides a product point of view. 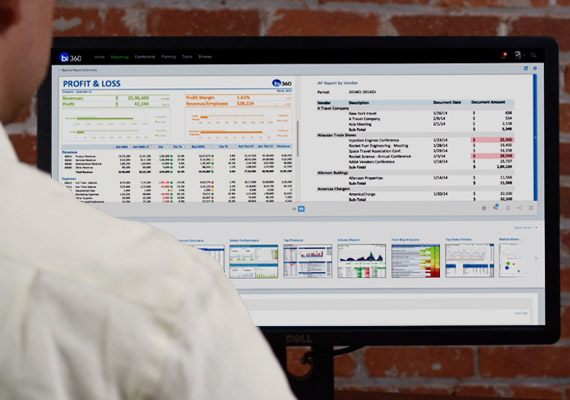 While transaction reports exist in all Enterprise Resource Planning (ERP) systems to review and analyze detailed data, this type of report is particularly powerful within a BI solution, specifically when tied to a KPI report or a dashboard. By allowing the manager to stay within the BI portal for all the information they need, the manager saves time and money on software licenses as he or she does not have to switch over to an ERP system for transaction-level analysis or stop their analysis in order to request this information from the accounting department. While all companies produce corporate-level profit and loss reports with relative ease, it typically requires more work to produce profitability by product, customer or project, usually because most companies do not book all or any of their expenses by business area. Given the value of knowing whether you are making or losing money in these areas, a good BI tool should deliver advanced allocations automatically based on rules, and therefore produce an array of profitability reports at ease. While it is very powerful for any information worker to have a mix of KPIs, dashboards and reports are easily available within the same BI tool. Due to time, skills, and access rights, analysis sometimes becomes amputated because it stops with a transaction report. Modern CPM tools allow for a cross drill. An increasing number of companies are going paperless in many areas of their operations. This typically includes acquiring a document management system that can manage scanning,filing of receipts and invoices, and tie them back to the ERP system. From a BI perspective, these scanned documents often contain detailed information not booked in the ERP system, and they can help users save time and improve analysis by eliminating dependency on their accounting department to find and access scanned documents. “Customer360” refers to a type of report that provides a 360 degree view of a customer. As organizations automate their administrative and operational processes with different cloud or on premise systems, there is an increasing amount of data available for areas such as customers, products, sales people, etc. All the disparate information is collected into a single database, typically a data warehouse supporting a BI solution, and then produced into a single report. This, ultimately, enables world-class decisions. This report should provide the key information about a specific customer while also weighing all the data points (sales, AR, ongoing support, etc. ), producing a single score so all customers can be rated from best to worst. Organizations depend on accurate reporting to drive high-level decisions. However, the variety of reports available shows us that a top BI solution can provide deep insights with ease. From readily identifying recurring issues across managers/departments to calculating certain clients or projects’ profitability, the report types described above show the value different kinds of reports. If you need assistance or help, Solver has a team of experienced professionals that can get your organization started in building the right template for you. This entry was posted in BI360, BI360 Dashboards, BI360 Reporting, Business Intelligence and tagged Benchmark Dashboard, BI dashboards, BI reports, BI Solutions, CFO Dashboard, customer reports, Dashboards, departmental dashboard, drill down reports, Enterprise Resource Planning, Executive Briefing Card, financial reports, general ledger report, KPI Exception Report, KPIs, PL Report, reporting playlists, templates, transaction reports by Sofia Iatarola. Bookmark the permalink.